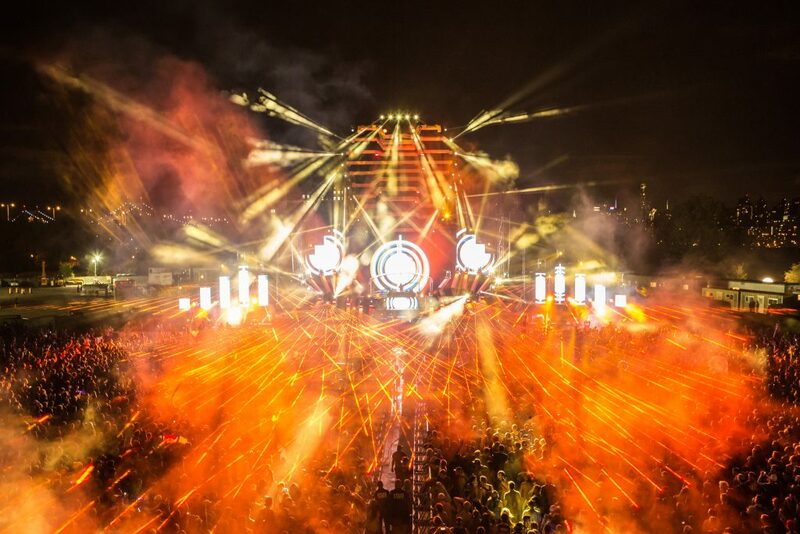 Photo by: aLIVE Coverage on behalf of Electric Zoo Festival. 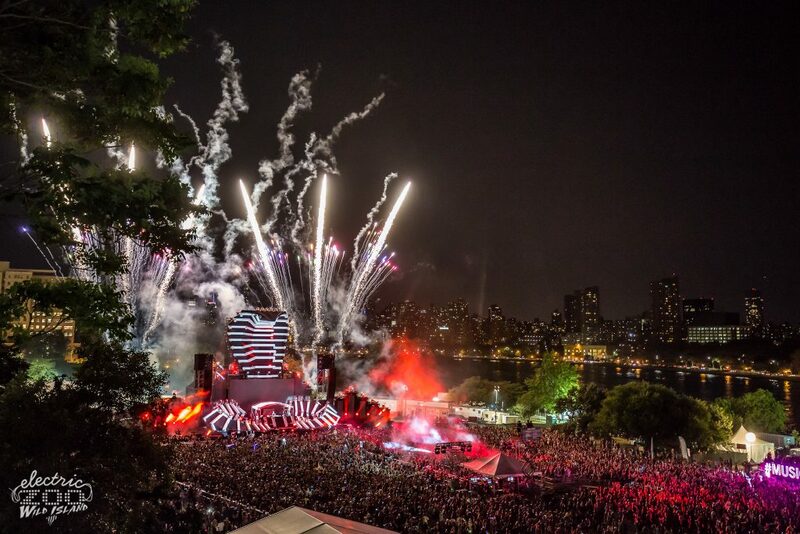 After tragedy and weather shortened the last few years, Electric Zoo finally makes a comeback with an amazing 3 day sold out weekend in New York. 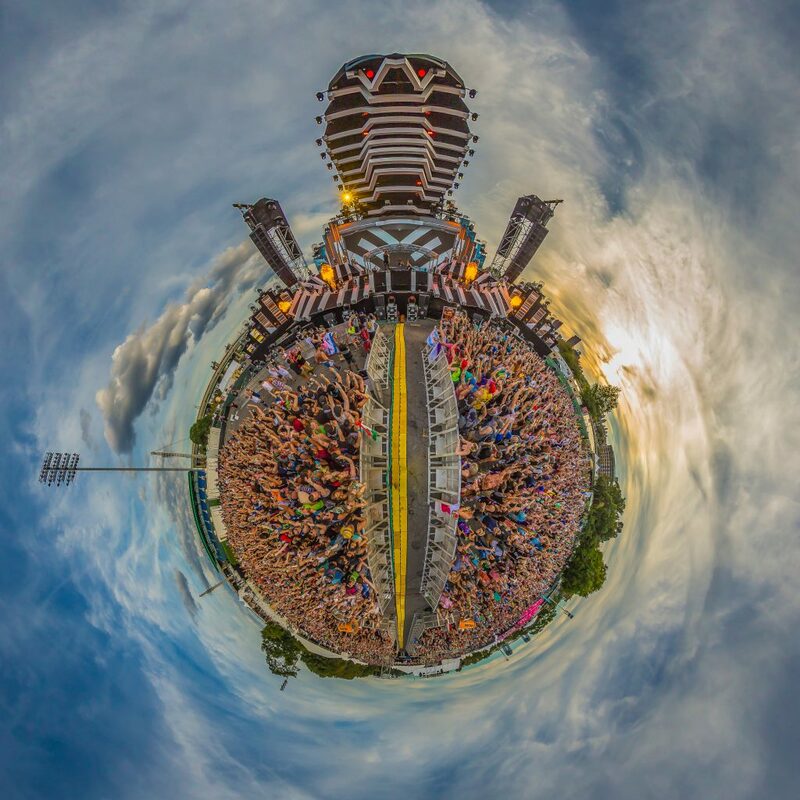 With the news predicting a possible hurricane strike this weekend, things looked grim once again for Electric Zoo. Everyone kept their hopes and spirits high and were rewarded with a beautiful weekend on Randall’s Island. With an amazing lineup and wonderful crowd, this was definitely the place to be Labor Day weekend. Day 1 saw the heaviest lineup out of the 3 days with a bass takeover at the Hilltop Stage. Flux Pavilion, Carnage and Bassnectar rounded out the night on the Mainstage. The production and stage for Hilltop was amazing. It was themed as a giant polar bear’s cave with visuals and lighting to go along with that. Illenium opened up the festival with an unexpected live set throwing down all of his originals and remixes while throwing in some bangers to get the crowd going. He premiered his new remix of “Say It” by Flume and had the whole crowd screaming the lyrics. G Jones was up next with his own unique style of bass music. He was having as much fun on stage as we were all having out in the crowd. Cookie Monsta and Funtcase going back to back to back was a sight to be seen. I don’t think I saw a more hyped crowd on Friday then I did for their set. All of my friends and I were sweaty messes after their set was over and I think we were all in need of neck braces. We made our way over to Mainstage to check out Flux Pavilion and this was our first time seeing the incredible Mainstage. The centerpiece for this year’s Mainstage was a giant cobra towering over the whole festival. With intense visuals and lighting, this stage blew my mind. Flux threw down one of his regular fest sets that we have grown use to seeing. Never the less, it was impressive and fun. I made my way back to check out Datsik on the Hilltop stage and decided to just hang out in the back so I could easily leave and make it in time to see Bassnectar on the Mainstage, afterwards. This is where I ran into my first problem with the festival. From the back and side of this stage, the noise bleed from Mainstage was terrible. I could barely hear Datsik’s set over Carnage on the Mainstage. I knew the stages were gonna be close, but had hoped they would have remedied this somehow. Either way, Datsik had an awesome and hard set that had me head banging the whole time. Last up for Friday was Bassnectar on the Mainstage. This was my first Nectar set and I was thoroughly impressed. His visuals were amazing and the crowd was really into the set. I was told by a friend of mine that is a huge Nectar fan that this was one of his softer sets, but it was still pretty crazy. Day 2 was a lot more chill and I had more time to explore the festival. I noticed right away that prices for food and drinks were incredibly high, even for a festival. Beers and mixed drinks were around $10, while food ranged from $10-$40+ . They hid this by using their EZOO bucks program which allowed festival goers to load money on to their wristbands. The exchange was $20 for 9 EZOO bucks. I was told later on that the costs were higher than I’m used to seeing mostly because the festival is located in New York City, but in my opinion, it was a bit exorbitant. The first act of the day for me on Saturday was one of my favorites, Louis the Child. They put on a spectacular show playing all of their crowd favorites and premiering some new songs. This was definitely one of my top 5 favorite sets from this weekend. Next, we made our way over to Mainstage to see NGHTMRE tear it up. This was a energy packed bass set that had the whole crowd moving. After this set, I was back off to checking out the rest of the festival. I noticed that Electric Zoo hired Celebrate Safe this year to help out with anyone in need. Their group of volunteers walked around the festival keeping an eye out for anyone that could need help. They had a large booth setup between Mainstage and the Hilltop Stage. They were handing out free water bottles and electrolyte packs that definitely came in handy during the early hour of the fest when it was brutally hot. All of the staff that I encountered with helpful and nice, and I still haven’t anything bad from friends about their experience with the staff either. One staff member even took their time to show me how to get to the media lounge when I was lost. This was one of the best staffed events I have ever attended. I even saw the security getting into the shows as they were dancing and having fun with the crowd. The water refill stations were easy to find but I only saw two of them. The lines were pretty long towards the end of the day. I made my way back to the Mainstage for the rest of the day to check out Borgore and my personal favorite, Porter Robinson. Borgore played one of his classic trap and dubstep sets that had the crowd riled up and having fun. I think I saw about 15 mosh pits in the course of an hour. Next up was Porter and I was more than excited to see what he had in store. This was my 3rd time seeing Porter and it was hands down the best. He premiered a new edit of his worlds set with new visuals by Gh0stdad. With the insane amount of production accompanying his set, I was blown away. I had to take a minute to collect myself once the set was over. Hands down the #1 set of the weekend for me. After his set we sat down and watched Tiesto’s set from the back. It was a surprising set coming from Tiesto. It was a lot higher energy than I expected and I was really impressed by the change. Saturday was over and as we were all filling out, I noticed a major problem that was entirely due to the festival’s location on the island. The lines to get out, either by ferry, bridge, or bus were incredibly long. The fest ended at 11:00pm and we didn’t reach the other side of the bridge until around 1:00am. The line was barely moving at all and with people shoving, it was chaos. The line for the ferry was not moving at all. With them charging around $50 for a ferry pass and advertising it as a quick way off the island, this was a major disappointment. The people waiting in that line had to have been there for hours after the fest was over. I didn’t personally see the bus line on the other side of the venue, but I was told it was just as bad and that ubers couldn’t get in or out. This led to us and many others leaving early on day 3 to avoid the rush. Day 3 was back at it with a stacked lineup all day with Buygore having their own curated stage at the Hilltop Stage. Valentino Khan was the first set of the day; bringing his signature fast bass set with him. It was loads of fun and had everyone primed for the rest of day. Up next was Getter, who threw down a surprisingly heavy set. The last time I saw him his set was a little weak, but he stepped it up majorly for Electric Zoo. He even started a huge mosh pit to the new Excision & Space Laces’ track, “Throwin Elbows.” Lil Dicky was up next after Getter. This was a set that I was excited to see since I have been a fan of his for awhile. His set was a ton of fun and he kept the crowd entertained with comedy in between each song. This ranged from him “dancing to EDM” to giving a crowd member a lap dance during one of his songs. We took a break to get some food and fill our waters up before going back to catch the end of Juicy J. This was definitely a change of pace and music from the rest of the fest but it was still a good time. Next, we made our way to Mainstage to get a good spot for The Chainsmokers. I can’t even begin to explain how good this set was. This was my third time seeing them and I was beyond blown away. They have always been one of my favorites, but this set was over the top. From crowd favorites to heavy dubstep bangers; this set never calmed down and had me in pieces by the end. This was my 2nd favorite set of the weekend for sure and possibly one of my top sets ever. Afterwards, we said our goodbyes to the festival and made our way to the bridge to leave. All in all it was a pretty amazing weekend spent with good friends and good music. I would definitely recommend this festival to anyone living in the northeast or Midwest.